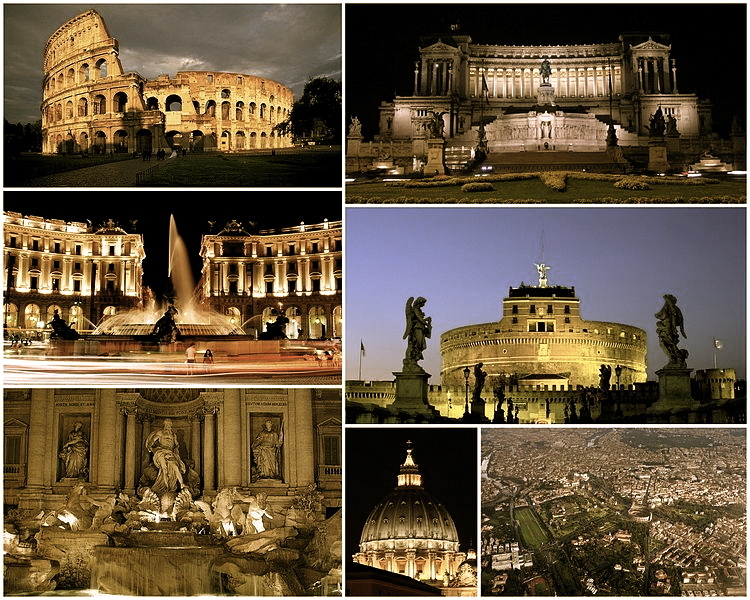 Rome the eternal city the mother of Christianity the center of antiquity consumes four days well deserved. • The Sistine chapel is very beautiful as is all the work of Michelango. • Visted Emanuel II buried in Parnthenon. • In church of Quo Vadis there is the place where Jesus appeared to St Peter. • St John the Lateran is one of many churches in Rome contains the heads of St Peter & St Paul & the holy table the Baptistry contains the place where Constantine stood & the singing doors. The second days sight seeing tour. • In St Pauls  there is a glass case in which the body of St Pius V is held… on his finger is a very large diamond & his original vestments are on him… he wears a silver mask. • In St Peters one half of the bodies of St Peter & St Paul are kept. • Caputian church contains Guido Reni‘s famous Saint Michael & the decorations with skulls. • Saw Saint Peters Church & many things Forum of Trajan where 85 cats now live. Got special permit to go thru Kings palace. St Mary the Greater has the ceiling made of solid gold brought by Columbus from his first trip to America. In the church of Saint Peter in Chains the original chains are preserved with which St Peter was bound & above Michelangelo’s famous Moses. In St Pauls the other half of the bodies of the two Saints are ???? . This is a new church & very beautiful in its simplicity. The mosaic of St Peter contains diamonds for his eyes. This 1928 silent movie from the Oklahoma Historical Society, sections of which have appeared in previous posts, follows the same route that Vincent’s tour took of Rome. Turn down or off the sound before viewing. 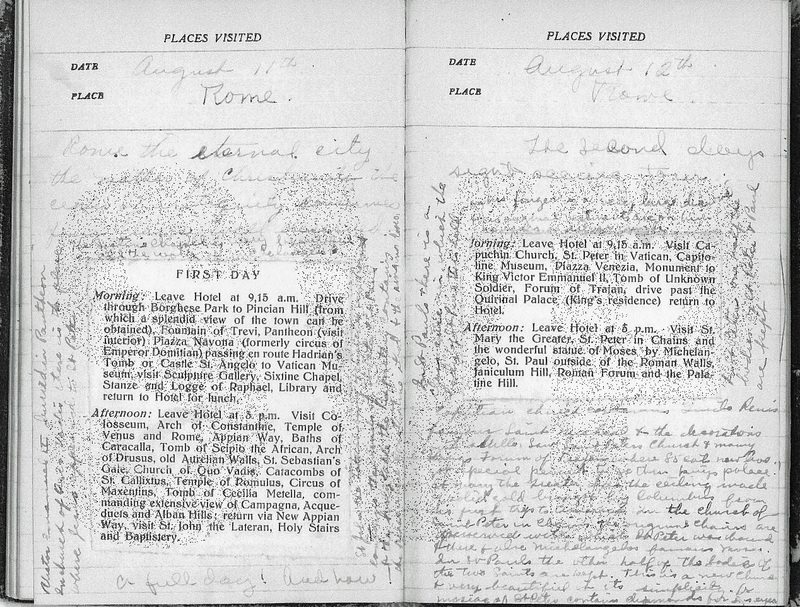 These pages in Vincent’s journal are made up of notes about the sites of the city that Vincent and his tour visted, written around a cutting from the tour guide. I have yet to work out which Saint’s Vincent refers to here. Can you help?